I am not well versed on shrimp genetics, but I would like to keep a shrimp tank that is "colorful" without having to do too much culling, or giving away shrimp that are clear or murky. The tank size will only be 3 gallon, so maybe at most a dozen shrimp. Option 2) is to get a bunch of crystal red shrimp and go ahead and let them breed. I don't care too much about fraction of red or white, but hopefully it won't result in a bunch of clear shrimp by the end? Option 3) is to get a bunch of random Taitibee shrimp from a local Craigslist seller and just let them "go at it". I don't know what will happen in this case. Will it also result in a bunch of dud shrimp? I'm not trying to be a breeder or seller, so I don't care about aiming for certain traits. Option 4) is to get a bunch of neo shrimp all the same color (e.g. 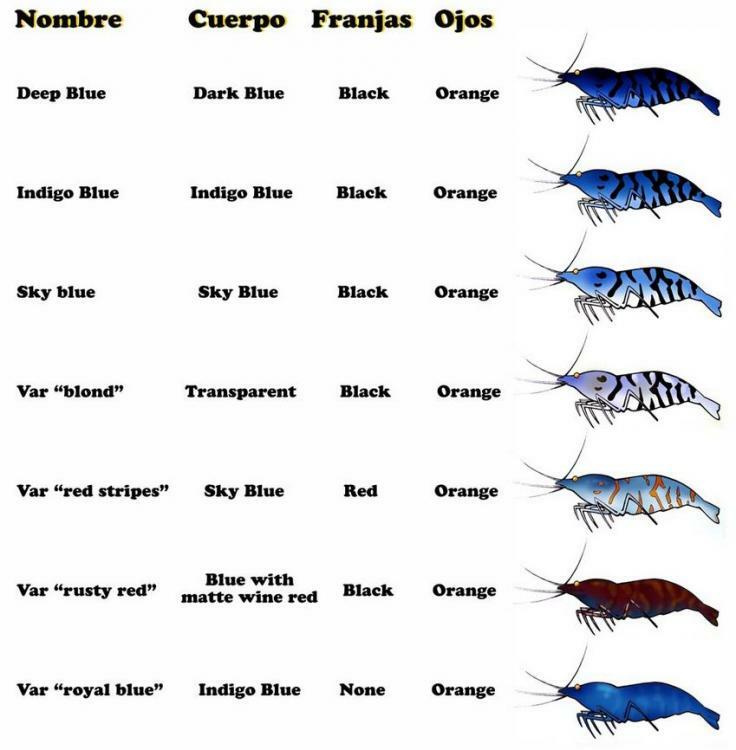 blue, orange), but my understanding is that the "solid-ness" of the colors will degrade with each generation, and occasionally there will be a shrimp of a different color? Any other ideas I haven't thought of? Bigger tank would help with parameters. If tank is currently set up for Neocaridina, you would need to do a make-over to have Crystals or Taitibees. Have you looked into tiger shrimp? 1. Maybe next time when my aquascape skills get better and I learn how to use vertical space. 3. Not really, since they are kind of clear looking and I can't get them locally. Option 5 - get a bunch of different colored neo Caridina and let them breed. You will need to remove the poor quality shrimp occasionally. Okay, so since you have Controsoil, are you using RO water and GH remineralizers? There are also tangerine tigers which range from yellow to orange with spots and stripes on them. Or I myself have YKK's which are believed to be TT hybrids with something else... they're just yellow shrimp but a *nice* yellow. Yes, there are a lot of shrimp people in California, but California is also a big state. That list you gave me last time was for Northern California, so some of those guys were still 2+ hours drive away. I live in Silicon Valley Bay Area, so there should be a lot of shrimp people here, but I don't see many selling bee shrimp. I did find thru Craigslist a guy selling CRS, and another guy selling thoroughly mixed Taitibee. A lot of people are selling through Facebook now-a-days, so it can be harder to find some of these shrimp people when they don't have an official website or page dedicated to selling their shrimp. Hey, I just read that if I keep all Taiwan Bee shrimp, their children will also be Taiwan Bees and not some reject hybrid. Guess I will have to do more reading after all. Red bolt, blue shadow panda, panda, all black, all red, red mosura, black taiwan bee, black king kong, black mosura. Some have dodgy, jazzy markings which some may consider culls but they are still beautiful to me! not to mention some have part pinto patterns as well. I am well happy but never expected such a variety from the first dozen mixture, ie I didn't start with any shrimp that had ANY black at all! I don't know what may happen longer term with them but am super happy so far. Iput a few pictures in the gallery if anyone wants to see them (I don't want to hijack someone elses thread)?